New Delhi: The All India Institute of Medical Sciences (AIIMS) on Monday filed a police complaint against ‘unknown’ supporters of Rashtriya Janata Dal(RJD) supremo Lalu Prasad for allegedly misbehaving with its staff. As per the complaint, some unknown miscreants created nuisance in the hospital area today against the discharge of Lalu from AIIMS. The complaint has been lodged with Hauz Khas Police station, which demands to register a First Information Report (FIR) against 8-10 unknown miscreants who “misbehaved with the AIIMS staff and created nuisance in the hospital area at around 12:15 afternoon on April 30, 2018, against the discharge of Lalu Prasad”. The complaint further alleged that the miscreants “damaged the glass door of CATH lab from rear entrance gate side resulting in injury to a security guard namely Khurshid Alam”. The AIIMS hospital, earlier today said that Lalu has been referred back to Ranchi hospital as his medical condition has improved significantly. 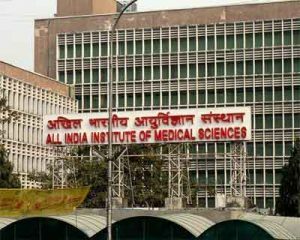 The RJD chief, who has been serving a jail term in connection with the fodder scam, was admitted to AIIMS on March 29 for specialised treatment. Earlier today, the RJD chief also wrote a letter to the AIIMS hospital authority requesting them not to shift him back to Ranchi hospital.